Rumors about an “invisible hand” influencing executive decision-making in the Blue House has been confirmed through the surprising revelation of Ms. Choi Sun-sil and her relationship with President Park. The smoking gun was the investigation of the Mir Foundation and K-Sports Foundation. 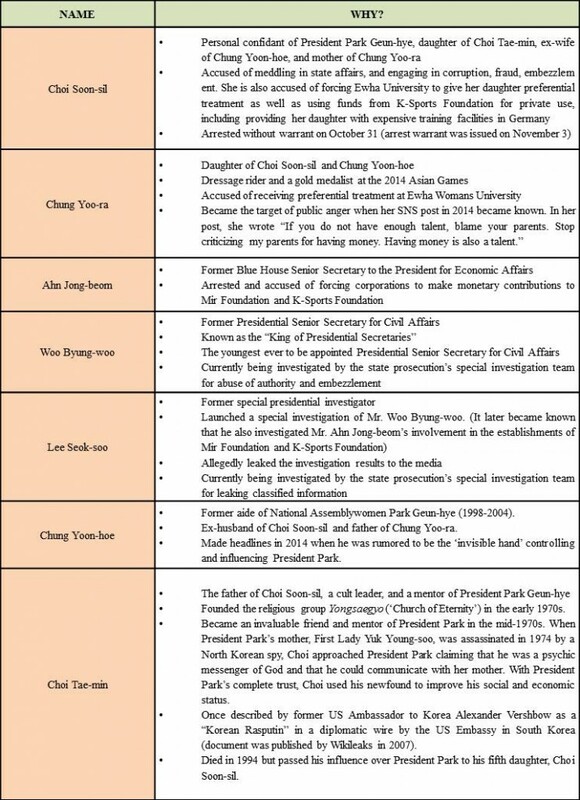 Ms. Choi Soon-sil, a longtime close friend of President Park, is believed to have been meddling in state affairs and using her relationship with the president for personal gains (see Timeline and Key Players). The public outrage and ensuing protests have resulted in President Park offering two public apologies. The first apology came on Oct 25 when she admitted that she allowed Ms. Choi to edit her speeches during her presidential campaign in 2012. She also acknowledged that she had shared other documents with Ms. Choi soon after becoming president. In her second apology on Nov 4, she took full responsibility for the scandal and stated that she would cooperate with the investigation. Approximately 100,000 people took to the streets in central Seoul to demand President’s Park’s resignation the day after her second apology. Approval ratings for President Park and the New Frontier Party (NFP) have plummeted. President Park’s approval rating hit rock bottom at 5%, the lowest rating for any South Korean president. The previous record was held by President Kim Young-sam during the Asian Financial Crisis. Approval rating for the ruling party has also dropped to 18%. If President Park decides to see through her term, this scandal is likely to further cement her lame duck status. Most members within the NFP have also begun to dissociate themselves from the president. An internal conflict between the pro-Park and anti-Park camps may even lead to a split within the party, which will have a significant impact on the coming election scheduled to take place in December 2017. The NFP appears deeply divided on the issue of changing party leadership. Anti-Park members have asked Lee Jeong-hyun, a prominent pro-Park member and the leader of the party, to resign after the scandal became public. With deteriorating public support, nearly half of 129 members are believed to be demanding Lee’s resignation.3 Kang Seok-ho, the only non pro-Park member within the leadership, has stated that he will resign if Lee does not step down.4 The floor leader Jung Jin-seok also stated that he will resign as soon as the next year’s budget is passed and a new cabinet is stabilized.5 With some members indicating their desire to leave the party, observers are claiming that a new conservative party is likely to emerge from this ordeal.6 However, experts state that there will be no massive defection in the short term as there is no clear front runner to lead the new party should an NFP offshoot materialize.7 The key will be how quickly the NFP can reformulate its platform and reinvent itself to become a more legitimate political force for next year’s presidential election. In the midst of political chaos in South Korea, it was reported that North Korea would test another Musudan missile during the first week of November.13 If it does, it would be the 9th test of its kind this year. The two previous tests came last month after North Korea celebrated the 71st anniversary of the founding of the Workers’ Party of Korea (WPK) on Oct 10. It is possible that the North may refrain from conducting another test given the political turmoil in the South and the lack of attention it would receive. Has the Korean public’s perception about the North Korean threat changed as a result of the recent round of provocations? The Asan Institute for Policy Studies’ survey shows that the Korean public’s threat perception has remained largely stable depending on the type of provocation. For instance, approximately 41-45% of the respondents stated that they felt insecure if North Korea engaged in a long range missile test. 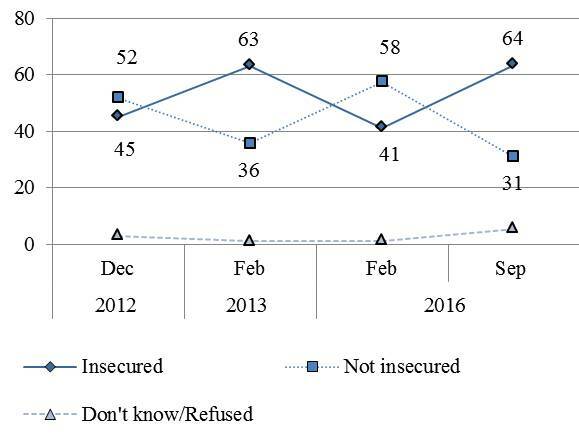 60~63%, however, stated that they felt more insecure after a nuclear test.15 This suggests that after controlling for the type of provocation, the South Korean public opinion about the North Korean threat has reached a ceiling. This is not surprising given that the type of provocation has remained similar over time. July 18: Chosun Ilbo reports that Mr. Woo Byung-woo, who served as Presidential Senior Secretary for Civil Affairs at the time, abused his position of power for his family’s economic benefit.23 Other media outlets report that he also used his position to benefit his son, who received a lightened military service duty and an internship at the National Assembly. Mr. Woo is also alleged to have embezzled funds from a real-estate company run by his family and lied about his net worth. July 25: Mr. Lee Seok-soo, an independent special presidential investigator, begins investigation into Mr. Woo Byung-woo 24. It later became known that he also carried out an investigation into Mr. Ahn Jong-beom’s involvement with Mir Foundation and K-Sports Foundation. July 26: TV Chosun reports that Mr. Ahn Jong-beom, a former Blue House Senior Secretary to the President for Economic Affairs, helped establish the Mir Foundation by forcing major corporations to make significant monetary contributions of around KRW 50 billion.25 More reports surface that Mr. Ahn helped establish K-Sports Foundation by collecting KRW 38 billion from major corporations. Mr. Ahn denied these allegations. August 17: MBC reports that Mr. Lee Seok-soo leaked the details of the ongoing investigation into a Chosun Ilbo reporter. September 26: Hankyoreh reports that Ms. Chung Yoo-ra, the daughter of Ms. Choi Soon-sil, was receiving preferential treatment at Ewha Womans University and that she was now in Germany preparing for the 2020 Tokyo Olympics.30 It later became known that funds from foundations like K-Sports had been funding Ms. Chung’s training in Germany. October 30: Ms. Choi Soon-sil returns to South Korea. October 31: Ms. Choi Soon-sil is arrested without warrant. November 2: Mr. Ahn Jong-beom is arrested. November 3: Arrest warrant issued for Ms. Choi Soon-sil. Gallup Korea, Date: Oct. 25-28; sample size: 1,033; margin of error: +3.0 at the 95% confidence level. Gallup Korea, Date: Nov. 1-3; sample size: 1,005; margin of error: +3.1 at the 95% confidence level. “친박계 몰락은 시간문제…새누리 의원 절반이 등 돌려,” 한국일보, 2016년 11월 2일. “[박근혜∙최순실 게이트] 벼랑 끝 이정현, 버티기 왜?,” 경향신문, 2016년 11월 6일. “與 “黨 책임” 고개 숙여놓고…의총선 ‘지도부 사퇴’ 난장판,” 동아일보, 2016년 11월 5일. “새누리 기반 붕괴 위기감…내분격화에 지지층 이탈,” 한겨레, 2016년 11월 6일. “계속 버티는 이정현…당 안팎 ‘친박, 물러날 타이밍조차 놓쳐,” 조선일보, 2016년 11월 7일. “총리 임명 주도권 치킨게임…미로에 빠진 거국중립내각,” 한국일보, 2016년 11월 2일. “[최순실 국정농단] 야 3당, 국조∙별도특겁 합의,” 경향신문, 2016년 11월 1일. “민주당 12일부터 장외투쟁 돌입…’청 대응보며 수위 높일 것,” 한겨레, 2016년 11월 6일. “문재인 신중론 vs 안철수 하야론…대선전략 따라 갈렸다,” 중앙일보, 2016년 11월 4일. “野도 탄핵·하야 부담… 2선 후퇴→ 조기 대선론 솔솔,” 한국일보, 2016년 11월 6일. “폭스뉴스 ‘북한, 24-72시간 내 미사일 발사’,” 조선일보, 2016년 11월 2일. “미 해군 X-밴드 레이더 북한 해역 주변 배치,” 중앙일보, 2016년 11월 1일. Survey dates: Dec 12~14 2012; Feb 16~18 2013; Feb 10~12 2016; Sep 21~23 2016. “161031-조선산업 경쟁력 강화방안,” 관계부처 합동, 2016년 10월 31일. “조선밀집지역 경제활성화 방안,” 관계부처 합동, 2016년 10월 31일. “정부, 공공선박 11조 규모 발주…해운선사에 6.5조 금융지원,” 2016년 10월 31일. “시늉만 한 조선 구조조정…1년을 날렸다,” 중앙일보, 2016년 11월 1일; “조선 빅 3 유지 -2만명 감원…알맹이 빠진 경쟁력 강화案,” 동아일보, 2016년 11월 1일. “조선 빅 3 유지 -2만명 감원…알맹이 빠진 경쟁력 강화案,” 동아일보, 2016년 11월 1일. “[취재일기] 혹시나 했더니…‘맹탕’ 조선업 구조조정,” 중앙일보, 2016년 11월 2일; “시늉만 한 조선 구조조정…1년을 날렸다,” 중앙일보, 2016년 11월 1일. “우병우 민정수석의 妻家 부동산… 넥슨, 5년전 1326억원에 사줬다,” 조선일보, 2016년 7월 18일. “특별감찰관, 우병우 수석 감찰 착수,” 중앙일보, 2016년 7월 25일. “청와대 안종범 수석, ‘문화재단 미르’ 500억 모금 지원,” TV조선, 2016년 7월 26일. “이석수 특감 중대 위법”… 靑의 정면반격,” 동아일보, 2016년 8월 20일. “우병우 보란듯 사표 낸 이석수,” 동아일보, 2016년 8월 30일. “K스포츠 이사장은 최순실 단골 마사지 센터장,” 한겨레, 2016년 9월 20일. “이석수 특별감찰관 사표 수리,” 조선일보, 2016년 9월 24일. “최순실 도넘은 개입…‘승마하는 딸’ 고비마다 특혜 논란,” 한겨레, 2016년 9월 26일. “’최순실 딸 특혜 의혹’ 최경희 이화여대 총장 전격 사퇴,” 조선일보, 2016년 10월 19일. “’비선실세 의혹’ 최순실 딸 SNS에 ‘돈도 실력…니네 부모를 원망해’,” 경향신문, 2016년 10월 19일. “대통령 “최씨 일부 연설 도움, 국민께 사과”…야당 ‘일방적 변명, 내각총사퇴·특검 도입’,” 중앙일보, 2016년 10월 26일. “檢, 안종범 내일 오후2시 피의자 소환…최순실 구속영장도 내일 청구할 듯,” 조선일보, 2016년 11월 2일. “우병우-안종범-3인방 교체… 朴대통령, 최측근 참모들 사표 수리,” 동아일보, 2016년 10월 31일. “모든 잘못 제 책임…특검수사도 받겠다,” 중앙일보, 2016년 11월 5일. “전기초, 야광봉, 핫팩…10만명 촛불집회 이모저모,” 경향신문, 2016년 11월 5일. “사과는커녕, 쏘아보고, ‘들어갑시다’… 기세등등 우병우,” 조선일보, 2016년 11월 7일. Gallup Korea, Date: Nov. 1-3; sample size: 1,018; margin of error: +3.1 at the 95% confidence level.